Federal health regulators are bolstering warning labels for popular pain relievers, adding information about the risk of heart attack and stroke in the short term. The changes apply to prescription non-steroidal anti-inflammatory drugs, or NSAIDs, including arthritis treatments like Celebrex. The agency said it plans similar changes to over-the-counter drugs in the same class, such as Advil and Motrin. Language on the pills currently warns that they can increase the risk of heart-related problems if used long term. However, the U.S. Food and Drug Administration's new warning states that heart attacks and strokes can occur in the first few weeks of taking the drugs. The agency also warns that the risks increase with higher doses of the drugs. The updates are based on an FDA review of recent studies and recommendations by outside advisers. "In general, patients with heart disease or risk factors for it have a greater likelihood of heart attack or stroke," the agency notes in the announcement posted to its website on Thursday. "They used to say they might cause risk of heart attack or stroke. Now we are saying they do cause increased risk of heart attack and stroke," FDA spokesman Eric Pahon told NBC News. People should check the list of active ingredients in the drug facts label if they aren't sure whether a product contains an NSAID and be careful not to take more than one product that contains an NSAID at a time, Dr. Karen Mahoney, deputy director of the FDA's Division of Nonprescription Drug Products, said in the agency's announcement. Although Aspirin is also an NSAID, the revised warning doesn't apply to Aspirin, the FDA said. Dr. David Henry studies the impacts of medication use at the University of Toronto. He's pleased the FDA strengthened the warnings. "We've known about these risks for 15 years and they've been slow to get clear and coherent information out to the public," Henry said. Health Canada acknowledged the risk of serious heart and stroke events on its website in April. 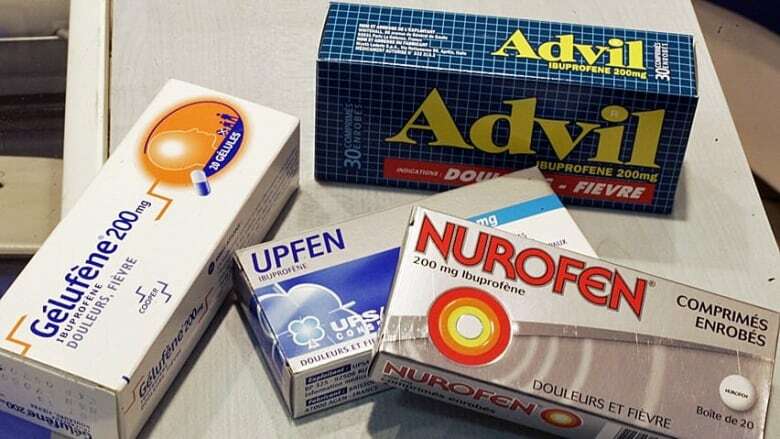 Consumer Health Products Canada, which represents manufacturers of over-the-counter medicines, said Health Canada's warnings apply when ibuprofen is prescribed. The U.S. labelling permits up to 10 days of consecutive use whereas the Canadian label is for up to five days for pain and three for fever, said Gerry Harrington of Consumer Health Products Canada. The U.S. labeling change is the latest step in the FDA's ongoing safety review of the drugs, which stretches back to 2004. That's when Merck & Co Inc. pulled its blockbuster pain reliever Vioxx off the market because of links to heart attack and stroke. Vioxx had been heavily advertised as a new kind of NSAID that was supposed to be easier on the stomach. But its withdrawal shook the medical establishment and ushered in a new era of drug safety at the FDA. In 2005, the agency added boxed warnings to all prescription NSAIDS, including Pfizer's Celebrex and high-dose versions of ibuprofen and naproxen. Celebrex is the only drug from the same class as Vioxx that remains on the market. The prescription NSAIDs are generally used for long-term chronic pain conditions like arthritis. The agency also added similar warnings to lower-dose, over-the-counter NSAIDs like Aleve and Advil. Those drugs currently warn patients to take the lowest dose possible for as short a period as possible. They are not intended to be used for pain longer than 10 days, according to their labels. "These medicines have a long history of safety and efficacy when used as directed," said the Consumer Healthcare Products Association, which represents nonprescription drugmakers, in a statement. The group said it would cooperate with the FDA as it requests updates to the labels. Advil is marketed by Pfizer Inc., while Aleve is sold by Bayer. Many generic drugmakers market cheaper versions of the drugs.